ABOVE: Water taxis are a luxury, not a necessity. In an effort to save money, visitors sometimes buy VeneziaUnica tourist passes online before they leave home, or they stand in line to purchase ACTV Tourist Travel Cards at vaporetto ticket booths the minute they arrive in Venice. Worse yet, out-of-towners frequently pay €7,50 for a one-way ride on a crowded vaporetto that may be slower and less comfortable than walking--or they may waste an expensive vaporetto ticket to cross the Grand Canal, when crossing by traghetto gondola ferry would be far cheaper. Our advice: Before buying a transit pass, give some thought to how you'll use it--and plan your sightseeing to make the most efficient use of the time you're paying for. Example: During a week-long vacation in Venice, you might want to visit the cemetery island of San Michele, the glassmaking island of Murano, the beaches on the Lido, and the islands of Burano and Torcello in the northern part of the Venetian Lagoon. By visiting those places over two or three days instead of scattering the visits over a full week, you can get by with a 48- or 72-hour Tourist Travel Card instead of the 7-day version. Unless you have mobility problems or you're staying on an island like Giudecca or the Lido, you can save time and money the way the locals do--by getting around on foot. Important: Remember to validate ACTV tickets! Before boarding a vaporetto or other water bus of ACTV, the local transit authority, be sure to hold your ticket or pass against the grey-and-white electronic ticket reader at the station entrance. Listen for the confirmation beep. (Ignore the green ticket reader if you see one.). Be aware that traveling without a validated ticket can result in embarrassment and a heavy fine. When traveling on a land bus, you'll also need to validate your ticket. Look for a machine as you board the bus. Another tip: Don't overspend on airport transportation. Venice Marco Polo Airport is only 12 km (8 miles) from the city center by road, or about 10 km (just over 6 miles) by boat. To cover that distance by land taxi can easily cost €60 or more, and if you take a water taxi to your hotel or cruise ship, you can expect to pay at least €110. We've even had e-mails from readers who were charged marked-up rates of €150 by sleazy hotel concierges or greedy travel agents. Fortunately, there are much cheaper alternatives, such as the Alilaguna airport boats (which serve a number of locations around the city) and airport buses (which offer frequent service to the Piazzale Roma). ATVO Treviso Airport buses operate between the Piazzale Roma and Treviso's Antonio Canova Airport, which is used by Ryanair and several other budget airlines. 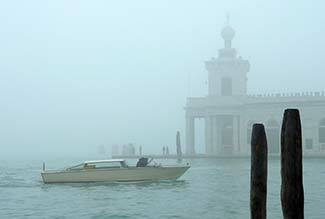 For more articles on reaching Venice and getting around the city, see our Venice transportation index.